She is one of the artists who developed graphic design projects for the catalogue in the 27th São Paulo Biennial, 2006 (7 October - 17 December 2006), according to the Universes in Universe. Yesterday we were interviewed on the ‘Artscape International’ operated by DAI NIPPON PRINTING Co, Ltd. The article is not introduced on the Artscape International web magazine yet, so we are not sure whether it will appear till it is finished proofreading…….. During the interview, the interviewer asked me to get the list of invited artists’ for residence since 1999, from Sapporo Artist in Residence Executive Committee, the predecessor of NPO S-Air to the present day. We had had various lists of invited artists. This time I have brought together all the past lists of artist. We had heard that he was going to stay in Germany for some time after his residence in Sapporo. Now his film work is going around with the German Media Festivals. ○ Information of the workshop supported by the Life Court Co., Ltd.
Look upon the snow mass building up willy-nilly and lying thick on the ground as a useful resource or art medium with artistic ideas ! Let’s change the view on snow in this project; the snow mass is seen as something annoying, tax consuming, and energy consuming in its removal, but now we can see it as a non-hindrance, something interesting and beautiful; moreover, it is like your seasonal partner ! This year, at the beginning of the workshop, deriving from the Sapporo’s annual Snow Festival at Odori Park, which has become a larger event, the participants will make a plan with group discussion, create the ideas with maquette (1:100) and exhibit them. The participant should research his or her idea on their own time before this workshop. During the three days’ workshops the participant will have group work, discussions, and a presentation by the lecturers. The aim of the workshops is to draw up a concrete plan and create a miniature sculpture or replica for the Sapporo Snow Festival in February 2007 or 2008. Preferable participants : Sapporo citizens, people who are interested in community activities and more than 18 years old, artists, and so on. The goal of this workshop is examining each idea with participants and artists, drawing up the plans for implementation, creating the miniatures with maquette, and analyzing how to present these ideas. In my opinion, examining ‘Sapporo Snow Festival at Odori Park’ chosen for this case study would be to create the realistic idea enough to suit any landscape. It would be necessary for the participant to raise more developed artistic issues than the existing idea, approach, and procedure of the current event, express his or her opinion and attitude on the clear view of art at this workshop, and in the end of the development plan for each future activity with this experience. The main participant would be a public citizen or a student. Hopefully, this workshop will offer an opportunity to exchange active ideas, discuss with one another in a relaxed setting, and share participants’ idea with other artists, architects and creators. Kamiel suggests exhibiting the miniature works with maquette which the participants made at the workshop during the Snow Festival and collecting the votes from the visitors and Sapporo citizens, as a result, he expects that people will be more interested in this new suggestion for the Snow Festival with an artistic idea. Moreover, he hopes each plan will be exhibited as the actual sized work at this winter or the next winter. 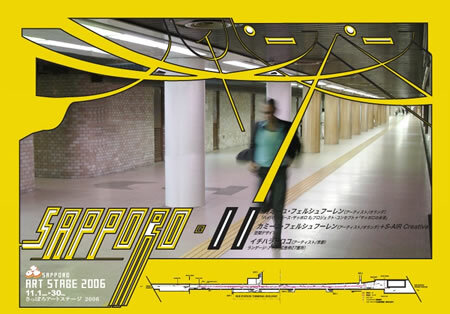 This workshop is also a part of the ‘Sapporo Art Stage 2006’ projects organized by Sapporo City. (By the meeting held) last week, two artists were selected and one artist finished just behind the successful applicants among 31 applications. The applications consist of independent applicants or two member units, and most applicants offer art organizations an exchange to develop the international cultural communication with ICC + S-AIR in perspective. 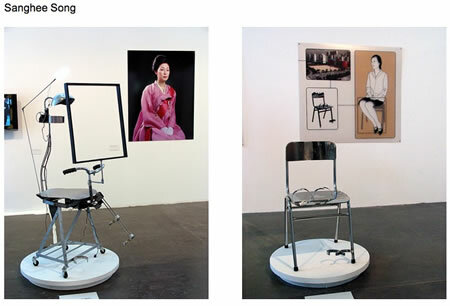 The two artists selected (the two holders) will be staying for two months: from 10 January to 10 March 2007. Participating in the Art Project for winter in the Moerenuma Park, “Snowscape Moere” (8 February – 12 February), they are showing their work in the gallery in the Hidamari, glass pyramid. He seems to have own unique sense and quality of art for his work, different from art senses and qualities which other artists have. His work also seems to have a sense of humor, so what he will create during his stay in Sapporo should be very interesting. Although the organization for the exchange would be a local Bulgarian art organization, presumably some unprecedented information can be expected because there has never been an exchanged art program between Bulgaria and Sapporo. The object observed with his earnest eyes in his DVD work gives us favorable impressions. There are only a few works that he submitted, but they show highly completed form. Bas Noordermeer will be expected to have the possibility to invent more development and change during his stay in Sapporo. ○Unfortunately, Corwyn Lund came behind the selected artists; however, his works exhibit interactive access with performance and humours and their qualities seem highly completed. His own aim achieved by staying at Sapporo in winter is shown in his application. There has not been an artist from Canada for the artists in residence program in Sapporo. We have an increasing attention on information related to art from Canada, which would be useful and attractive. The mercer union which Corwyn Lund introduces as an art organization for the exchange must run artistic activities. We are also interested in the system in which the artistic activities are positively encouraged by the national grants in Canada.